This Audrey Hepburn, famous My Fair Lady Hat is available at Dallas Vintage Shop as well as any other Vintage Hollywood Classic Movie Star hat or costume you can imagine. 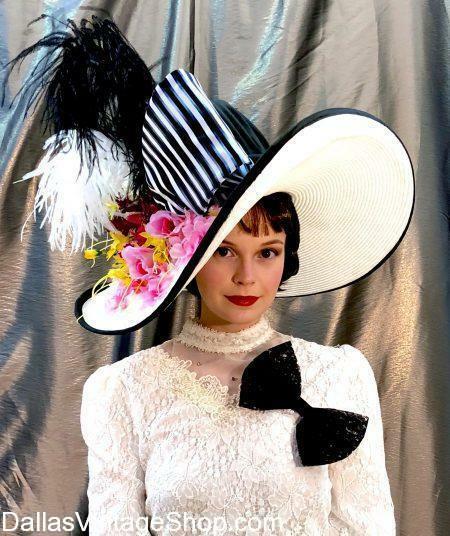 You must come see our huge collection of Vintage Hollywood Glamorous Hats for occasions like The Mad Hatter’s Tea & Luncheon at the Dallas Arboretum or for the Kentucky Derby or for Theatrical Broadway Musical or Classic Movie Lady Characters Outfits besides the Audrey Hepburn one shown here. Audrey Hepburn! Look at this ‘My Fair Lady’ inspired hat, it’s unbelievably beautiful and we have it at Dallas Vintage Shop. This Vintage Hollywood Audrey Hepburn inspired hat was specially made for The Golden Age of Hollywood, Mad Hatter’s Tea & Luncheon, a special Dallas Arboretum event. This one of a kind, special recreation, My Fair Lady hat is one example of the kind of Vintage Hollywood Glamorous Hats available all the time, all year round. We limit this and other Iconic Hat reproductions to one per event, per season to assure you that you will be the only one at your event with this hat. There are many, many other one of a kind hats in our enormous collection of Classic Hollywood Glamorous Hats, Movie Iconic Characters Costumes, Hats, Wigs and Accessories. The most popular Vintage Hollywood Movie Starlets and Classic Movie Lady Characters Outfits are waiting for you. Plan your own Hollywood Stars or Academy Awards Cat Walk Themed Party or Gala. Who would you like to be? Never forget, we have the Classic Vintage Hollywood Iconic Hats because Vintage Glamor is a specialty here. Many of the Glamorous Hollywood Iconic costumes are one of a kind recreations and Dallas Vintage Shop is the only place in the DFW area to find them. We have the ‘Show Stopper’ Hollywood Vintage hat or costume for you. Get Hollywood Classic Movie Character Hats & Costumes like this unforgettable My Fair Lady Iconic Hat. Hollywood Diva hat prices range form special supreme quality hats to median and economy ones. Let us customize your gorgeous hat on the spot in our unique hat creation department. Need a one of a kind hat creation that will guarantee to make you stand out at the Tea Party or Hollywood Red Carpet Party? It’s impossible to imagine our unlimited supply of feathers, flowers, tool, lace and beautiful sprays to add to your hat. Get all your costumes or hats for any occasion at the largest Costume & Hat Shop in the Dallas Metroplex. You are in Audrey Hepburn category.